Dennis James and Lauryn Shapter, aka Truckstop Souvenir, have just released Under a Big Blue Sky. The first time I heard of Truckstop Souvenir was when Dennis James got in touch with me back in 2006. He’d heard Fairfield’s community radio station KRUU-LP 100.1 FM was looking for show hosts. Dennis and his wife, Lauryn Shapter, were moving to Iowa, he explained, and he would love to spin some tunes in the Americana vein, a type of music he and Lauryn had been creating together in Seattle, Washington. At their website, I found a pic of the two of them draped around some kind of big ol’ American gas guzzler. It was such a cool portrait, I immediately fell in love with the idea of working with them. Who showed up were two committed souls, committed to moving to Iowa, committed to writing and performing music, committed to doing radio, committed to fighting mountaintop coal removal, committed to bettering government policies, committed to living a lit life. Even though they’d just uprooted from the Northwest, they struck me at first blush as having their roots firmly in the ground, half-oak and half-willow, the type of folks who’d clearly be an asset to any community they chose to live in. It was later that I learned neither one of them was from Seattle. Turns out Dennis is originally a Texan, which makes perfect sense when you get to know him, while Lauryn is from East Harlem and grew up in Queens. The fact that they both gravitated to Seattle in pursuit of music dreams, met and married, and then chose to relocate to the heart of the Midwest is pure serendipity. Dennis is a tall drink of water with clear eyes and a soul patch, usually sporting a cowboy hat. You can feel Texas in his gait. Good-humored but no-nonsense, articulate, expansive, informed, he’s a little larger than life in a down-home way. You would never guess he studied economics at university—especially when he is playing guitar or mandolin, or helming the home studio that has birthed the duo’s sophomore release, Under A Big Blue Sky. Lauryn hails from that grand old country mecca known as the Big Apple. That’s right, New York City, skyscrapers and everything. When you think of Americana, it isn’t usually NYC that pops into mind, but is there really a place in the U.S. that is more of a melting pot, more quintessentially American? I just get a kick out of the Truckstop geometry of Texas, New York, Seattle, and Fairfield. Though Lauren is classically trained, with a degree in performance, her fiddle playing in the duo is sparse and haunting in the sweetest way, not unlike her vocals. She adds a softness that is anything but pliant, an open-eyed nurturing quality that I’m sure served her well as an inner city schoolteacher. Vocally, TS meld into one voice, harmonies matching seamlessly. Make no mistake about it, these two are passionate storytellers and deeply committed songwriters, strong voices both, and it shows in their original material. They write separately, Dennis steeped in the Texas school of songwriting, Lauryn enamored with the Scots-Irish tradition of Appalachian ballads, with song styles intertwining into a perfect braid all their own. Both are excellent conversationalists and total naturals as radio hosts. You can hear Dennis’s show Gravel Road Radio Tuesdays, 2-4 p.m., featuring the best in roots and Americana music. Lauryn’s show Crooked Sister Radio Hour airs Thursdays, 10 a.m. to noon, and highlights women in roots, Americana, country, and bluegrass. Settling into Fairfield in September 2006, the two spent most of 2007 touring coast to coast across 22 states, behind their debut release, Leave Nothing Behind. By the end of 2007, a new crop of songs were beginning to bloom. Their new release, Under A Big Blue Sky, has just been completed. 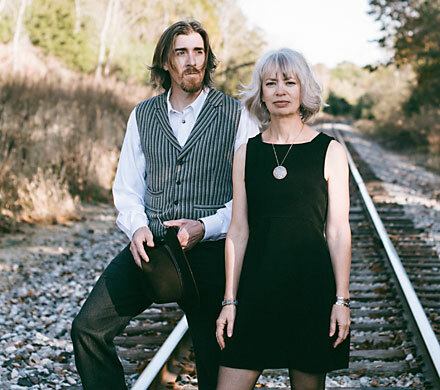 It was recorded in their new home’s attic-turned-recording studio, “during quiet moments stolen in between the frequent coal trains on the Burlington Northern line at the edge of town.” The songs reflect “both the roads that led Dennis and Lauryn to Iowa and the life they found when they arrived,” as it says on www.truckstopsouvenir.com. It opens with Lauryn’s “Song for Iowa,” at once plaintive old timey and roots modern Americana, explaining better than I can why they ended up here. All I can say is, thank God the Iowa prairies whispered her name as she was driving to the mountains of Colorado, and thank God they chose the cultural landscape of Fairfield to park the Truck. Listening to Blue Sky is like driving a pickup down the countryside on one of those perfect Indian summer afternoons. I especially love the instrumentation and rolling motion on Dennis’s “The River is Wide” and the sonics on Lauryn’s “Sing Those Blues Away.” This is a record about dusty roads, roadside motels, railroad men, rivers, and rodeos. Lauryn, who did a stint as a music writer in Durango, CO, some years back, interviewed Kathy Mattea on her radio program about Mattea’s self-released CD Coal, something Lauryn is passionate about. A song on the new release is dedicated to West Virginia native Maria Gunnoe, who is fighting mountaintop removal mining in the Appalachia Mountains. The last cut is a touching opus to humanity, complete with cello, entitled “Rodeo,” the vocals slightly exuding Tom Petty underwater colors. Truckstop Souvenir performed most of the parts themselves on the new record, along with special guests Troy Morgan (She Swings. She Sways) on upright bass and Donna Nelson (Southeast Iowa Symphony) on cello. Eminently likeable, Lauryn and Dennis have created a recording that is deep, personal, open, raw, intimate, musical, and ultimately hopeful, less in terms of the promise of the American Dream than in delivering something more immediate, more existential, more purely Hank, in the deepest sense of the word, something you can tie your rope to. Never mind American dreaming, these songs celebrate American being.